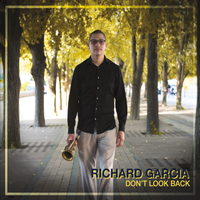 Debut album from award winning saxophonist Richard Garcia, featuring original composed music that takes you through an emotional journey and portrayal of life experiences. Performed by an outstanding ensemble based out of Boston and New York. The title track, “Don’t Look Back”, was created initially from an assignment that Miguel Zenon gave to me while studying at New England Conservatory. At this point, I had already had a library of compositions and an understanding of the overall theme that my music would sound like in each period of my musical growth. Its overall arch begins with a piano ostinato that says to me, “Are you ready for your next move?” The bass joins with the melody that comes in layers of confirmation. The peace continues through a journey that rhythmically and harmonically shows you the way with the conclusion of, no matter what decision you make, you are successful because of your efforts, so let’s continue this or move on to the next! “I Love You”, is a composition that I wrote in dedication to my sister, Stephanie Ann Garcia, who passed away from leukemia in 2004. She was the definition of happiness, cheer, and joy. She certainly lived by the motto, “Don’t Look Back”, without even realizing it. She had mastered this over a decade before I had even become familiar with the idea. I was at my friend’s house, during my time studying at NEC, and was in deep thought and evaluation of my life and purpose. Suddenly, Stephanie appeared during my meditation and I saw her dancing, which everyone knew she loved to do! The tune that she was dancing to was the theme song from Barney. Anyone that Steph was close to, basically everyone she came in contact with, would know that she religiously watched this show. Immediately, I started humming the tune, which also happens to be the same tune as, “This Old Man”. I wanted to capture the excitement and happiness that she felt while watching this show and singing this song. I also envisioned, musically imitating my family’s reaction when they heard the theme come on over the TV speakers.